I want to thank Thomas and David at Cajun Gun Works for the great service! I'm not mechanically inclined so it was a no-brainer in deciding to send my SP-01 and 97BD to CGW. Once Thomas had the CZs on the work table, it was easy communication and great input on the technical side of the my order. There was some trigger work (RRK) including replacement of some springs and small parts and polishing, replacement of the stock sights and a hammer upgrade. The 97 received the bushing upgrade. 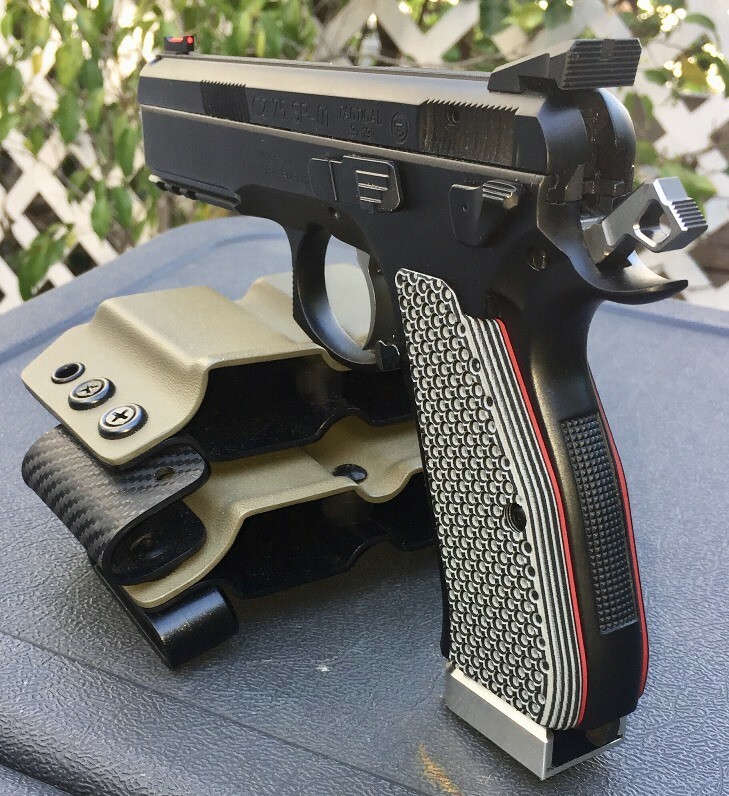 I settled on an 8 lb DA trigger pull with a 3.4 lb SA trigger pull for the SP-01. 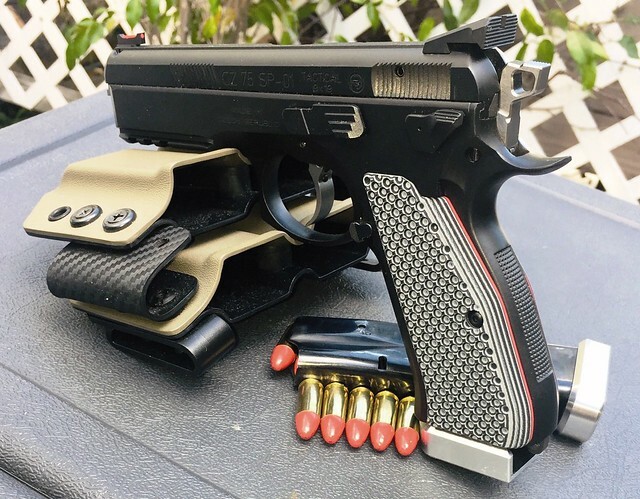 The 97 BD has an 8 lb DA trigger pull with a 3.2 lb SA trigger pull. Pictured below are the actual first 4 shots on the 9mm; 2 on top of each other. First thing I said was "D***!" The trigger is very smooth for both DA and SA. 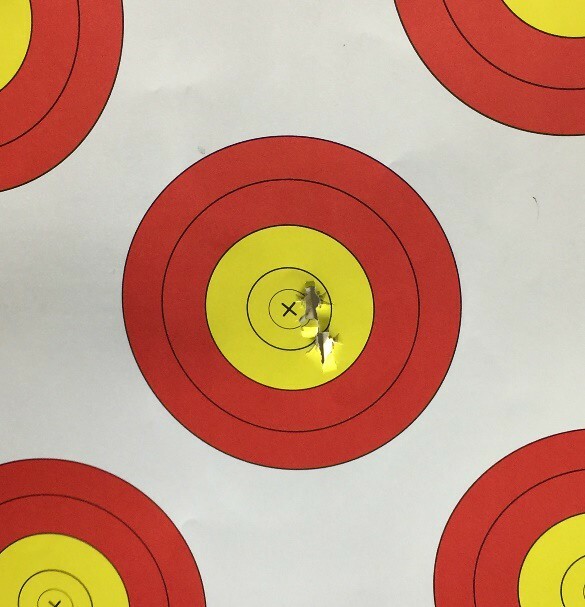 (target was at 7 meters with 115 grain 9mm Fiocchi ammo). The results for the 97 were the same for the 1st 2 shots! 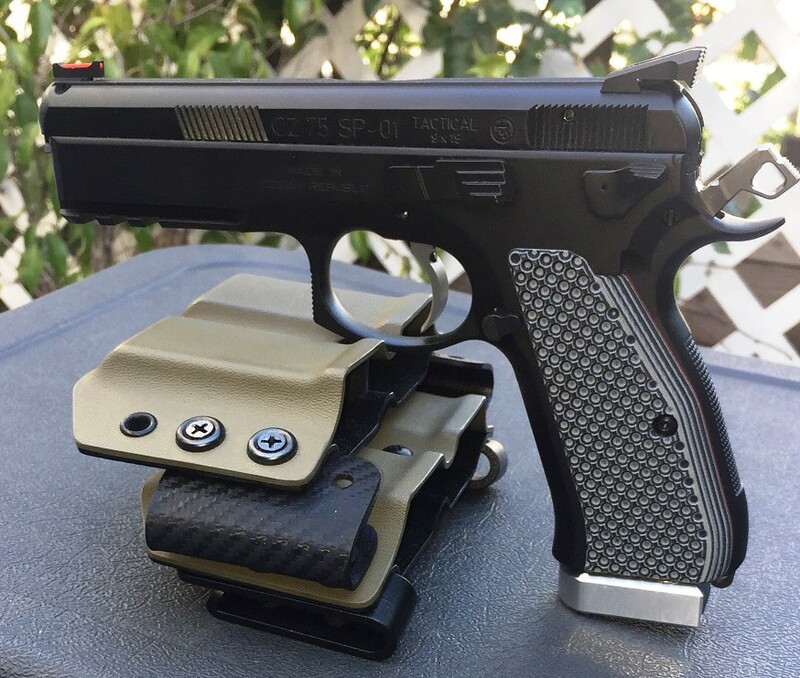 The LOK grips and Springer Precision base pads were recent additions and I want to also thank the folks at both companies for their customer service and fast delivery! Needless to say, I am very happy with how the project turned out! Please note: Dummy rounds used for the picture and for dry fire. The only time live rounds are near my handguns are at the range. Sweet! Love the look of the LOKs with the liner. Nice. My CZ collection consists of the same 2 guns but mine are manual safety models, for now anyway. I'm planning to do similar upgrades also. 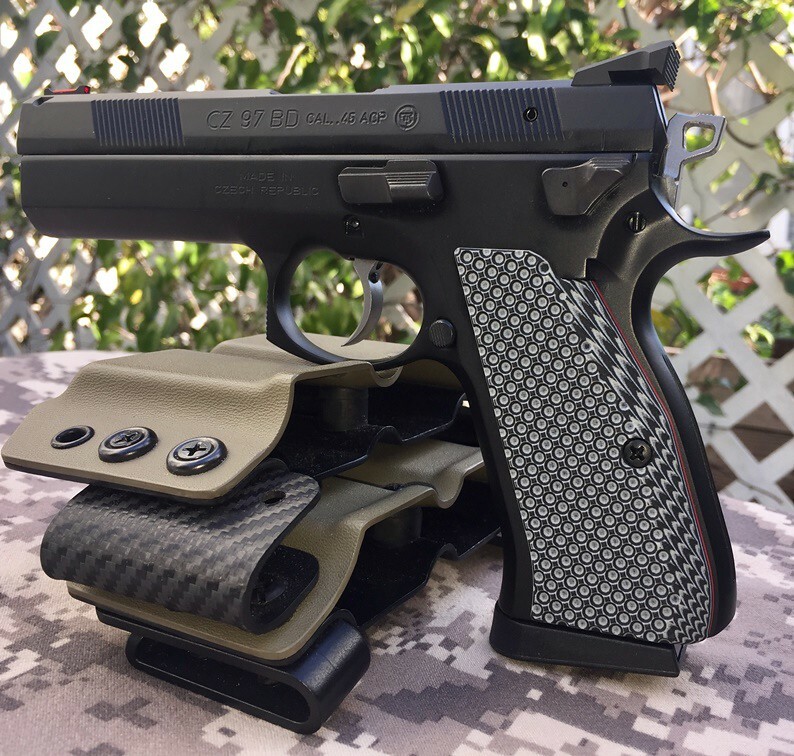 I say "for now" because I really want a P01 and a Tactical Sport. LSG had both in stock when I picked up the 2 I own, hoping the still do when I go back in a few weeks. Looks very similair in grip width?? 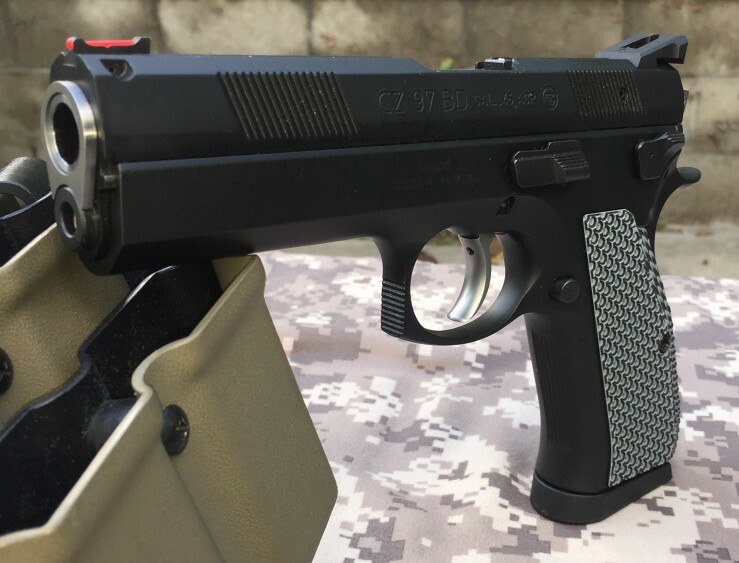 According to LOKgrips, the CZ-97 measures 1.170'' total thickness across with the thin bogies grip model. I am not sure I can feel the decrease in thickness, but I can definitely feel having more of a stable and firm grip with these when shooting. As an afterthought I had also considered the stainless race hammer but I had already ordered the black one. It made sense to match the trigger. CZ 85 Combat, NRA Lifer. dcl, quad mag holder is from Defy Concealment. I wish I ordered a few more; great product and got it at the great price 2 years ago. I have been thinking of sending my SP-01 Tac in as well. I think the RRK would be great for me since the reach is just a little long. 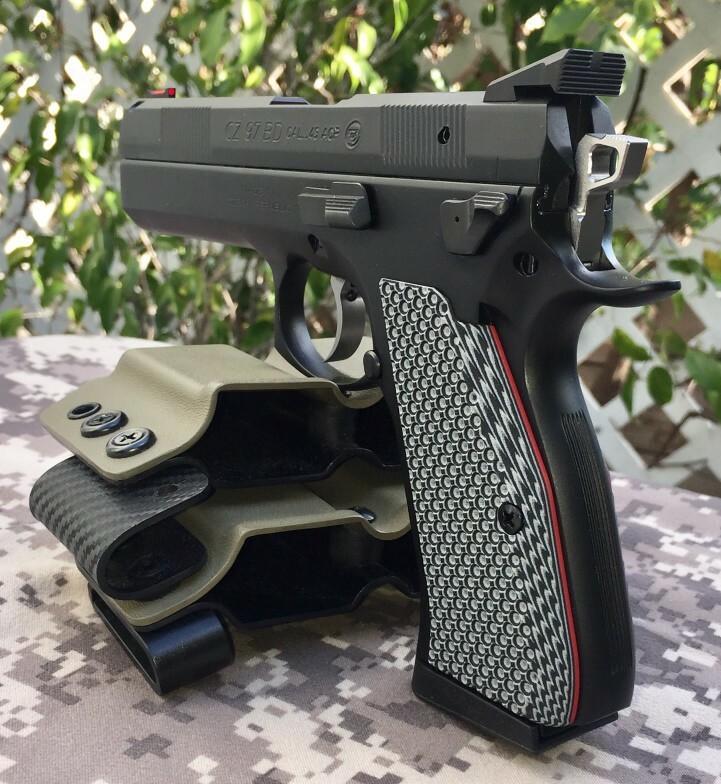 How much of a difference did the RRK make for you on the SP-01 TAC?